This is a detailed view of the lower panels of the cross head of the Tall (or West) cross at Monasterboice. South Side. Winged animal is licking its paw. MacAlister, R.A.S., Muiredach, Abbot of Monasterboice 890-923 A.D. His Life and Surroundings 1, , Dublin (1914) . MacAlister, R.A.S., Corpus Inscriptionum Insularum Celticarum 2 1, , Dublin (1949) . Stokes, M., Petrie, G. Christian Insciptions in the Irish Language II 1, , Dublin (1878) . 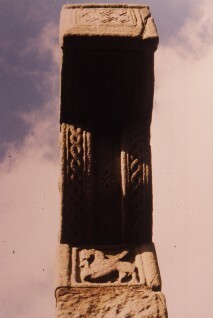 Roe, H.M., , ‘Muiredach's Cross, Monasterboice’. In Ireland of the Welcomes, January-February 1963 (1963) 2, 5, 17-21.